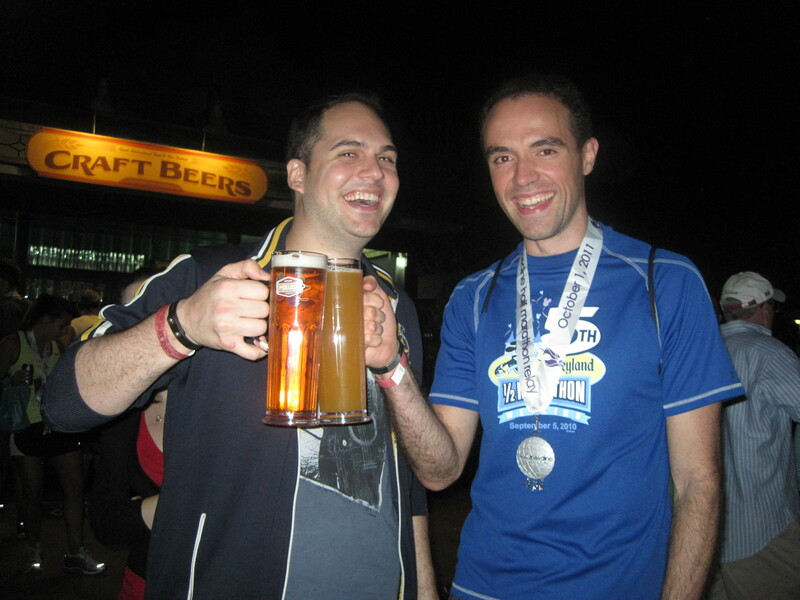 Upon completing the 2010 Disneyland Half Marathon, I knew I had to sample the rest of runDisney’s series of endurance events. When they unveiled the Wine & Dine Half Marathon last year, I was intrigued (but also a little saddened because it replaced the Tower of Terror 13K, which I also wanted to run). However, it took place the week before the Chicago Marathon and even amateur distance runners know that you don’t run 13.1 miles the weekend before you run 26.2 – that is, unless you want to hurt yourself. But then in February of this year, Steph found herself in an odd predicament: she had a free flight on American Airlines that was expiring but no plans to go anywhere. Just days before the reward was set to expire, we were at a bar with some friends, when one of them, a marathoner herself, asked me if I knew about the Wine & Dine race. 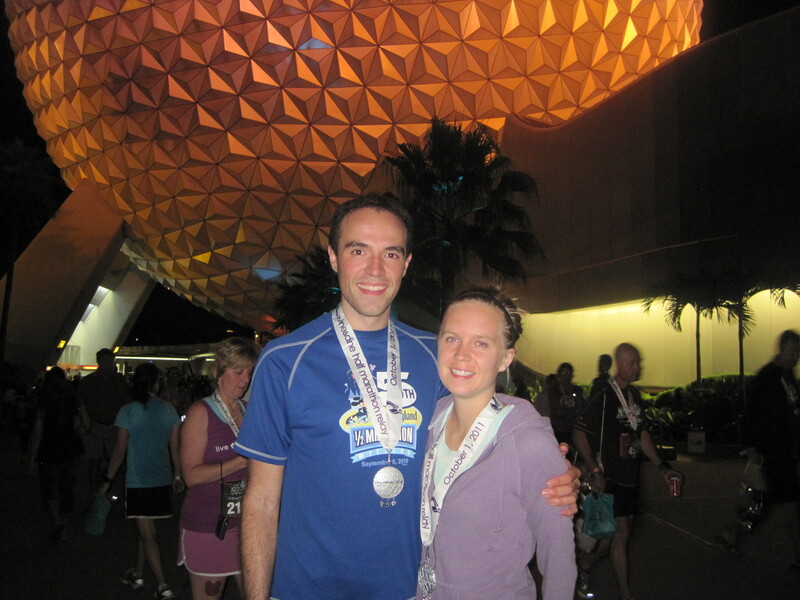 I said yes, and I thought it was a neat idea to hold a nighttime half marathon that ends at a food and wine expo. That made Steph’s head turn and, in what has been one of the most shocking moments of our relationship, showed actual interest in running it. Granted, she wasn’t talking about running the half marathon but instead splitting it into a relay with me. But still, she’s a swimmer and a reluctant runner, so I decided to make it happen before she could reconsider. With plane tickets and a race registration under our belts, we needed a place to stay. That’s where our good friend Paul came in. Because of his preferred status with Marriott, he is constantly being inundated with timeshare offers in exotic locations. He has organized two very fun and successful trips so far to California with these absurdly cheap deals, where the only catch is that you have to attend an aggressive sales pitch. These can be awkward conversations that end in the salesperson calling the next twenty years of your life meaningless and/or asking you to abandon paying for your parents’ healthcare. Those were real situations and that’s why Paul’s a trooper. 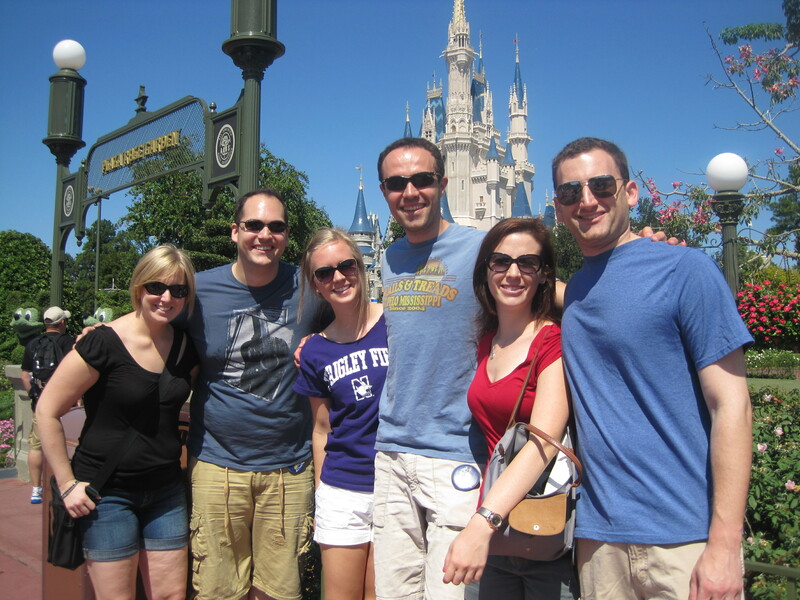 Of course, any trip to Disney World and its surrounding second-tier theme parks draws a crowd, so with us came our friends Ryan, Liz and Marla to add to the festivities. We spent Saturday at Magic Kingdom, celebrating the park’s 40th birthday by tearing through the galaxy in Space Mountain, thwarting Emperor Zurg’s battery-based galactic takeover in Buzz Lightyear’s Space Ranger Spin, cavorting with melodious ghouls at the Haunted Mansion and waiting for almost two hours to watch as Kaylie and Amber let over 160 Fast Passers board Splash Mountain for every 10 people in the regular line (we call class warfare). Oh, and we also watched in bitter disappointment as Stitch stole the essence from what used to be the awesomely terrifying Alien Encounter and turned it into a cutesy gigglefest. Not cool, Disney. Stop paying attention to weeping kids and their angry parents! But despite a few logistical hiccups – it was actually more like a comical series of delays – it was a very fun day. Later that night, Steph and I made it to the parking lot of the Disney/ESPN Wide World of Sports complex to get the race started. I don’t know if Disney is hyper-punctual or too overeager, but we did so much waiting for what seemed like no reason. Though the race started at 10 PM, we were told to be at the start by 8, which meant that Steph got to nap for an hour and a half before lining up at the start. Meanwhile, I boarded a shuttle that took me to the relay exchange in the parking lot of Animal Kingdom where I would wait for almost two hours. Fortunately, it was 70 degrees with a tiny breeze. The exchange happens around mile 4.8, where runners doing the relay split off from the group and enter a chute. Their corresponding runner sees them and after a brief celebratory high five or a hug, continues the race. Even though I was getting anxious to run, I was enjoying seeing these brief moments of elation and camaraderie. I’ll admit, I come close to tearing up whenever I see people finishing marathons with their parents and seeing father-daughter relay teams was no different. Since the race utilizes a wave start, I assumed that Steph would be in the later waves, so I was anticipating making the switch around 11:15 PM. But then at 10:55, lo and behold, she emerges from the trees with the rest of the runners and into the relay chute – turns out she started right at the front of the pack by mistake. Whoops. After seeing that she was fine and just wanted to stop running, I made my way out of the relay chute to join the rest of the pack. Steph had run the first leg at her own pace, so when I entered the crowd of runners, I was definitely doing my fare share of side-stepping. I was feeling amped, energized by having spent an entire day looking forward to the race and encouraged to run fast by the cool air around me. My first mile was basically spent exiting the Animal Kingdom parking lot, followed by two miles on Osceola Parkway, heading to Disney Hollywood Studios. I was running comfortably at a 7:30 pace, passing literally everyone I could see, slowing down only for the occasional rolling hill. Around my third mile, I started suspecting that perhaps I should be running slower, but that thought was banished when the course turned right onto East Buena Vista Drive and into Hollywood Studios. The sight of the Twilight Zone Tower of Terror sent enough adrenaline into my legs to carry me another ten miles. And that’s why my fastest miles were the next two. Call me childish, but running through these parks is a blast for me and the organizers did a great job with the Hollywood course. It started by running a loop around the famous dilapidated hotel of horror, giving runners a few seconds to behold the giant guitar that marks the entrance to the Aerosmith Rock ‘n Roller Coaster. It then cuts right into the heart of the theme park and wraps around Mickey’s wizard hat from “The Sorcerer’s Apprentice,” where energetic music was being piped in from every speaker in the park. From there, it turned under the Pixar Studios arch and entered the Back Lot Tour, where costumes and props for many Disney movies are allegedly made. The course then continued onto the Streets of America and to my surprise, every building had been draped in bright Christmas lights with “The Christmas Song” echoing through the streets. Finally, it heads towards the park perimeter and exits into the parking lot. 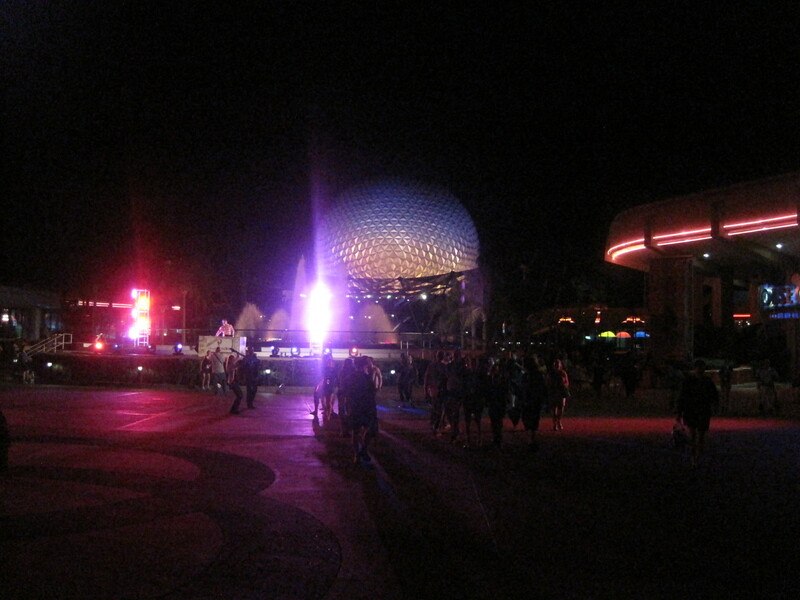 From there, the race runs on a path alongside various ponds and Disney hotels before reaching the Avenue of the Stars, a street that hugs Epcot Center and ushers runners into the finish chute. I finished my leg in just over an hour and our relay time for the half marathon was 2:00:42. After collecting my medal, I found Steph waiting for me, ready to enjoy the expo. We met up with our friends inside shortly afterward and treated ourselves to craft beers, a few tasty morsels of food, but more importantly, a negligible wait time for Test Track. 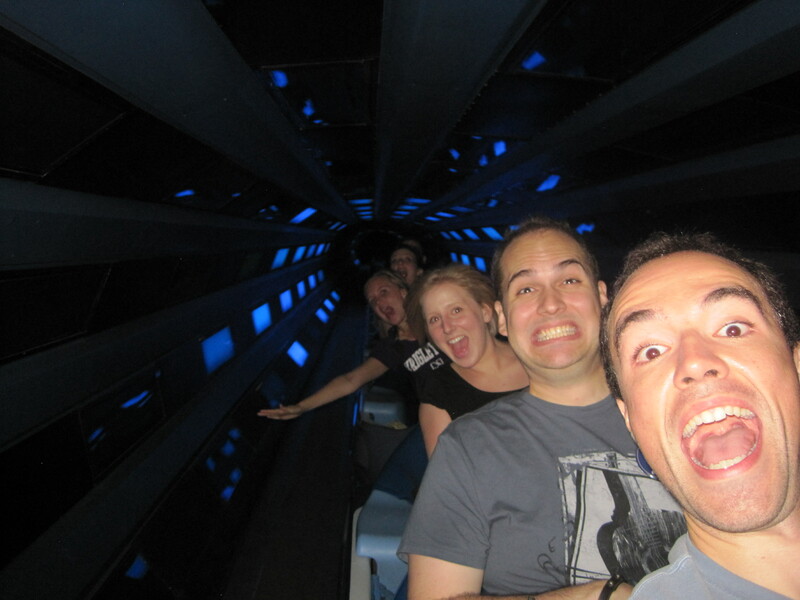 They also went on Mission: Space, but I decided to sit that one out because I’m not a fan of rides that spin you mercilessly. So instead I had another beer. All in all, I loved this race experience. The 8.3-mile relay leg fit perfectly into my marathon training program, so I treated it like a fast tempo run and never came close to exhaustion. The course was delightful and, had I not signed up for this weekend’s Chicago Marathon, would definitely run the complete half marathon in future years. Since it has the same (admittedly pricy) registration fee as other Disney races but grants you access to Epcot’s Expo and select thrill rides, it’s definitely worth the money. The organization, though a little demanding of your schedule, is still exactly what I’ve come to expect from Disney: top-notch and, in a few moments on the course, absolutely magical. But now it’s time to get through the last nerve-wracking week of the marathon taper. It looks like it might be slightly warm this year, so I might as well start hydrating now.